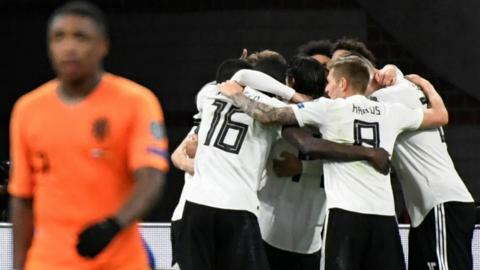 Nico Schulz scores a last-minute winner as Germany gain revenge over the Netherlands with a Euro 2020 qualifying victory in Amsterdam. A remarkable series of events was set in motion after East Germany's 1-0 victory over West Germany, their only ever football meeting. What makes the perfect World Cup penalty? Just how bad are England at them? Does luck come into it? Your guide to World Cup shootouts. Scotland face a tough challenge to take something from a Germany team brimming with talent, writes Alasdair Lamont. Germany manager Joachim Low has concerns over his strikeforce ahead of the Euro 2016 qualifier against Scotland. Tommy Docherty talks to BBC Scotland's Tom English about captaining Scotland who beat world champions West Germany. Germany were worthy World Cup winners at the end of a vibrant tournament, says chief football writer Phil McNulty. Which Germany player impressed with his high-tempo work-rate, and how will Lionel Messi's final contribution be remembered?